I remember when my dad died, I would go downstairs to his little sculpting area and sit and look at things realizing that he put them in the spot they now layed and they had not been disturbed by others. We remodeled the house and moved in after my mom died 8 years later and his little niche in the world still hadn’t been moved. I couldn’t bear doing it so He had to clean it up. AS I plowed through his pack rat corners to toss or keep things I thought were important, I disturbed the memories….then when we moved to KC, we really broke the spell. I pulled his old sled out of the storage room today to use as a winter decoration and I stalled looking at the rope he had probably tied on it. I also recognized the “G” he painted on it. Exactly like the G he used to put on his flashlights and lunch box in order to identify them when he worked in the factory. At that time, he changed his initials….same G but also put an M half inside the circle and half outside the circle. MG for Marvin Green. 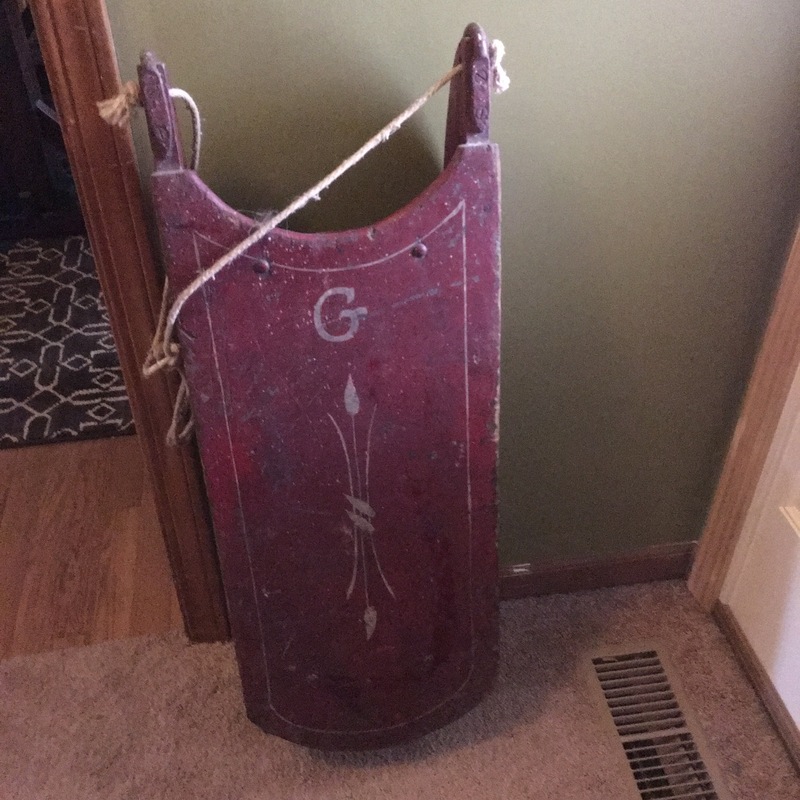 MY dad would have been 100 years old November of this year so this is an old sled!….and I can only imagine him as a kid sliding down a big farm hill into the snow covered cornfield. But I’m not a heavy metal girl although I like Disturbed because of David Draiman’s voice. Sounds of Silence Blows me away. I admit a girl crush on the Wilson girls in Heart. The night they sang a salute to Led Zepplen at the Kennedy Center Honors is my favorite….Stairway to Heaven ….. my emotional go-to song. I frequently find myself mental flapping with regret about things I should have done or things I should have said. You know…..the past. Just as I think I’ve about to let go of the past, something pops into my head and I have to ruminate about it for awhile….that only causes dredging up the things from the past that I wish I would have done differently. some of those things are a consequence of my upbringing ….as in I HAD NO IDEA THAT I WAS FREE TO MAKE THAT DECISION BASED ON MY OWN NEEDS. I was raised to be a people pleaser and peace maker from a young age so I carried that into young and old adulthood believing that I had to make decisions to make others happy and knowing that I could just make it work. Enter my new mantra….I made decisions in my past based on my knowledge and circumstances at the time. I can spend a lot of time thinking about and wishing I had done things differently…but it is the past. I made decisions based on my knowledge and circumstances at the time. Just as I’m free to do today and tomorrow. I eat an apple every night before bed. An apple with some peanut butter on each slice….or perhaps I should say I eat some peanut butter and just use the apple as the conveyance to my mouth. Recently I’ve had one of those ….am I crazy and not paying attention to the simple things…moment. He has been buying apples from Price Chopper with the stems still attached. I had foregotten that apples have stems and it took me back to my younger years when apples always had stems and we would twist them off using….he loves me, he loves me not, he loves me until the stem broke off. I didn’t get married until I was 23 so you can imagine how many stems I twisted in my life! With the holidays approaching, I’m starting to feel anxiety about all the things I have to remember to do…not just for the holidays but seems my list for the next two months is very full…putting this into perspective, I can spend an entire week in my house with nothing important to do and I’m very content….so you can only imagine when my calendar fills up with two things a week for two months how stressed I am. I decided to make a list. I named it my anxiety list. It’s hanging on the fridge and when I have accomplished something I cross it off. I hate lists! What happens if you forget to put something on the list and you rely solely on the list and then realize 2 months later you have foregotten something important? Well, there you go…. 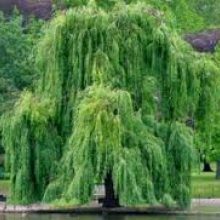 I remember visiting my sister -in -law and family in South Dakota one year….many moons ago….she took us to a beautiful park/arboretum full of trees and blooming flowers lining walking paths…I remember wishing that I lived in a city that thought it was important to support such beauty. A little background…there was an older gentleman who lived alone on the outskirts of Newton….a farmhouse on many acres of land. This gentleman was blind and after his wife passed, he would call the police in the middle of the night because he would drop his remote from his recliner and couldn’t find it. This happened frequently. Even though the police officers were always willing to help him out, I always hated having to dispatch a car there to pick up the old guys remote…I was torn between compassion and thinking this is not what cops should have to do. Mr Patterson finally died and this dear old man left his farm to the city of Newton to be used as a park stipulating it be named after his wife. Agnes Patterson park…which it was and became a beautiful flower garden arboretum with walking trails. I never met with Mr Patterson face to face but I talked to him several times a week on the phone but he will linger in my heart forever. Just a little insight into the good hearts of the police officers I have worked with and the gift from a blind old man! As far as political commercials, there is nothing like living in Iowa pre-first-in-the-country-caucus…finally breaking free from Iowa, our heart went out to those we left behind. Nothing prepared me for the deep and endless sewage from the television during this big election season. When you live on the state line, there is double the political commercials…I can’t keep track of who is spewing for Kansas and who is spewing for Missouri. It’s a freeking nightmare! STFU!!! We are very lucky to be surrounded by folks who are embracing ancient techniques to aid in living healthy lives. The more I’m willing to step out of my comfort zone and open my mind to new healing methods, the more I realize that being a skeptic about things I did not understand was limiting the tools to live a healthy, happy life. We don’t have to pop a pill or rely on traditional medicine for everything. This traditional medicine has its place in our lives but it is not the only thing to use. Especially after losing my kidney to cancer earlier last year, I’ve had to use stretching, ice, rest and other methods to deal with pain as I no longer can use Advil, etc because I need to keep my remaining kidney healthy! After my foot reflexology session today, I’m thankful that I reached out and tried this technique. I keep learning…essential oils, massage, stretching, yoga, meditation, reflexology and acupuncture…these are all available for us to live healthier lives the natural way.